Our vision is to set the standard for a new and fresh kind of Talk Radio, creating conversations that are changing the world, one listener at a time! 10:00 am pacific Question-able Conversations ~ Dr. Glenna Rice MPT: Parenting ~ Business & Your Body: What does the earth require from you? 11:00 am pacific The Dr. Pat Show: Talk Radio to Thrive By! : Abundant Health in a Toxic World with David J. Getoff! If you are someone who would rather eliminate the causes of diseases and watch the symptoms go away by themselves, this book is for you! David specializes in reducing or eliminating causes to help his patients and students improve their health. Drugs are generally suppressors of symptoms while the condition gets worse! Sacred Garden Spaces, Plant-Based Medicine. 10:00 am Pacific-The Dr. Pat Show: Talk Radio to Thrive By! : Sacred Garden Spaces, Plant-Based Medicine, Daily Practices to Achieve Happiness &Well-Being with Jessi Bloom! Creating Sanctuary: How can you come home to yourself?. We often feel like running away into the arms of nature from our humdrum urban existence. Creating Sanctuary shows us that this natural haven can well exist in our own backyard! Holding Firm In a Storm! Who are you now? : On Figuring It Out! 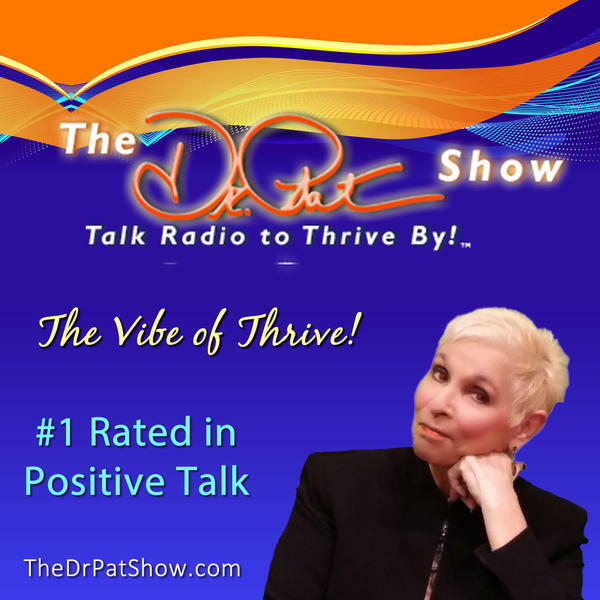 10am Pacific-he Dr. Pat Show: Talk Radio to Thrive By! : Dog Bite Prevention Week-DeCarlo, PETA & Egg Labels-Behr, Finances-Cavanaugh, Affordable Housing-Goody & Green WHEN THE BARK IS NOT WORSE THAN THE BITE…. National Dog Bite Prevention Week is April 14-20, 2019. The Postal Service is driving home the message that dog bites are a national problem and education can help resolve the issue with Linda DeCarlo! And tips for preventing dog bites ?HUMANE? OR ?FREE RANGE? LABELS MAY NOT BE WHAT YOU THINK! Class-Action Lawsuit filed by PETA Warns Consumers That So-Called ?Happy? Hens Are Suffering. More with Jennifer Behr! THE IMPORTANCE OF HAVING YOUR FINANCES ‘IN CHECK' The importance of becoming ?financially savvy? and tips to do so with Chuck Cavanaugh! HOME IS THE KEY TO A BETTER FUTURE! Habitat for Humanity Joining Nest to Raise Funds for Affordable Housing throughout April. Lauren Goody and Allison Green on 'Home is the Key' campaign! 11am Pacific-Access To Autism Therapy-Merahn! World Meningitis Day-Friedland & Advento! An Eggcellent Day at the White House!-Weaver. ACCESS TO AUTISM THERAPY DELAYED BY OVER A YEAR on average, according to New Nationwide Survey! New survey of parents of children with autism uncovers unmet needs, treatment impact and societal perspectives with Dr. Steven Merahn! APRIL 24 is WORLD MENINGITIS DAY! For Those Who Experience Meningitis, the After Effects Can Last a Lifetime with Dr. Leonard Friedland and Sheila Advento! THE WHITE HOUSE EASTER EGG ROLL celebrates its141st year! Thousands of families and America's egg farmers join on the south lawn for the White House Easter Egg Roll with Molly Weaver! Oscar and Grammy Award winner Melissa Etheridge and her 'Fearless Love' Tour & CD How to deal with Anxiety & Stress with Mary Jane Mack & CRA. With the help of Mary Jane Mack and the proper nutrition find out how to relieve your stress and Anxiety. Also when you are dealing with stressful situations how it affects the people around you and your pets. There is Hope to handling Stressful situations in your life. Be the Light that You Are. On the Edge of Reincarnation: Healing the Past.